“On Monday evening, the principal tradesmen of the city and vicinity, held a ball and a supper at Dyde & Co.’s Mansion House Hotel, in celebration of the anniversary of the Tutelar Saint of Scotland. The dancing commenced about 7 o’clock, and continued with great spirit till after midnight, when the company to the number of 150 sat down to a sumptuous and elegant supper, which reflected great credit on Mrs. Dyde’s taste. The supper room was handsomely decorated for the occasion having at the upper end a transparency representing St. Andrew at full length. After the supper the dancing was resumed and continued with much vivacity till after five, when the party retired to their respective homes highly pleased with their entertainment. The Scots continued to honour their patron saint more or less regularly from this time, whether privately, with dinners, balls or theatrical entertainments. The 1830s were a politically turbulent period in Montreal’s history, and in the years leading up to the 1837-38 Rebellions, ethnic and political tensions were particularly high. The city’s population began to organise themselves along national lines, starting with the St. Patrick’s Society, which was founded in late March 1834. The Société St-Jean-Baptiste was formed in June that year. It was during the celebrations for St. Andrew's Day that year, that some of the most active and conservative amongst the Scottish residents in Montreal resolved to found the St. Andrew's Society of Montreal. November 30th having been a Sunday, they gathered for a public dinner at the Albion Hotel on December Ist to celebrate the feast day of their patron saint. In an atmosphere of goodwill and nationalistic enthusiasm, the 120 participants, chaired by the Hon. Adam Ferrie, agreed to form a charitable society. Its aims would be to preserve Scottish traditions and relieve the distress of their unfortunate fellow-countrymen who were arriving at the Port of Montreal in ever-increasing numbers -strangers in a foreign country without any assistance or guidance, as governmental aid at that time was non-existent. At the first meeting of officers on March 27th at Orr's Hotel on Notre Dame Street, it was decided to acquire a common seal and to approve designs for an ornamental Certificate of Membership. The printing of 500 copies of the constitution for distribution to the members was also authorised. At later meetings in April and May, it was resolved that orders for flags, banners and transparencies, for use at the first anniversary festival in November, should be transmitted to Scotland with the instructions that they be "handsome but not too costly". They spent £115 on these items. Also included in the order were the collars and badges for the President, Vice Presidents and Office Bearers. Sadly these items have not survived to the present day. It was also resolved that the President and Secretary should obtain from Scotland an order of heather, broom, whin and thistles, as well as an anker of genuine "Mountain Dew "' for use at the newly-formed Society's first St. Andrew's Day festival. The letter containing the order, dated June 8th, was addressed to Messrs. George and James Robertson, relatives of Dr. Robertson, at Register House, Edinburgh. On the recommendation of the subcommittee, it was decided to obtain the banner of St. Andrew in Montreal rather than order it from Scotland. Subsequently, the ladies associated with the members kindly offered to make one and present it to the Society. Thus began the St. Andrew's Society of Montreal under the competent guidance of the Hon. Peter McGill, President of the Montreal Bank (Bank of Montreal), the Hon. Adam Ferrie, businessman and parliamentarian and John Boston, Esq., lawyer, businessman and Sheriff. All of these highly respected men of integrity were Scottish-born and educated. The St. George’s Society was formed in January 1835, and was followed by the German Society, formed in April.While the formation of the St. Andrew's Society and concurrently the other national societies of Montreal may, in large part, be attributed to the political disturbances of 1834, the main function of the society was to provide relief and comfort to their less fortunate brethren, many of whom were victims of famine or the Highland Clearances. Prior to the first St. Andrew's Day Meeting on November 30th, 1835, it was reported that 384 members had been enrolled. The Earl of Dalhousie, a former Governor General of Canada, had also requested to be enrolled as a member and had offered to assist in obtaining the flags and decorations in Edinburgh. His proposal was heartily received and he was immediately elected as the Society's first Honorary Member. The banner was described as "exquisite and costly alike in its material and workmanship " and as the order for the other flags and decorations had not yet arrived from Edinburgh, it was doubly appreciated. At the conclusion of the anniversary meeting, the members of the recently formed St. Andrew's Society of Montreal, accompanied by the other national societies, walked in procession to St. Gabriel Street Church, where the Rev. Mr. Esson preached a sermon. In the evening 150 members and guests (including five pipers - later approved as "Pipers to the Society") dined together at Rasco's Hotel. At the time of their inception, all four conservatively oriented natinonal societies: St. George's, St. Patrick's, the German and St. Andrew's, entered into an arrangement whereby they would all participate in each other's Church Parade on their respective anniversary day. This practice was followed until the 1837 Rebellion, at which time it was discontinued. This friendly co-operation between the sister societies has continued throughout the years, with the surviving societies continuing to attend each others’ events. Later in 1836, a letter was received from the Earl of Dalhousie expressing his gratitude at having been elected an Honorary Member. He enclosed the sum of £100 "to aid in the relief of such distressed countrvmen as reached these shores from whatever cause". In acknowledging this gift, the President was asked to convey the high feelings of gratitude, admiration and esteem which the members entertained for his kindness. In March 1837, a bizarre incident occurred when a British newspaper reported the death of the Earl of Dalhousie. A meeting of the office bearers was immediately summoned and a notice was issued to the members in general requesting them to go into mourning for thirty days. On March 17th, while the Society members in deep mourning were accompanying the St. Patrick's Association to church, word was received from Britain that the report was untrue, the Earl still being "in the enjoyment of his usual health". Perhaps the false report was a premonition because on March 17th of the following year authentic news was received that the Earl of Dalhousie had indeed died. Members of the Society, who had lost a truly good friend and supporter, went into mourning for thirty days as a mark of respect to the memory of a noble gentleman who would not soon be forgotten. At an annual dinner more than ten years later the Hon. Peter McGill proposed a toast to "the memory of the Earl of Dalhousie, the first patron of the St. Andrew's Society of Montreal". This salute was drunk in solemn silence, followed by the sound of the pipes playing "The Flowers of the Forest". The long-threatened rebellion broke out on November 6th, 1837. The Loyalist members of the Society were immediately put under arms to assist in maintaining possession of the country against the uprising led by the "Fils de la Liberté". The customary November 30"' procession was cancelled at the request of the Magistrates, and at a subsequent meeting of the Office Bearers it was also decided to cancel the dinner because most of the members would be on military duty. Nevertheless, about thirty of the members gathered at Orr's Hotel for supper to celebrate the Anniversary as well as the news that Colonel Wetherell and the Royal Regiment had just that day returned to town from St. Charles, bringing with them a large number of prisoners. In 1838 there was another uprising, on November 3rd, and the members were once again put under arms. However, as a much larger body of regular troops was available than in the previous year, it was resolved to observe the Anniversary Festival by a procession and dinner. On November 30", therefore, the Society walked in procession to St. Gabriel Street Church and in the evening seventy members and guests dined together at Orr's Hotel. After the toast "Our motto - 'Relieve the Distressed'", President McGill addressed the company in regard to the destitute widows and orphans of the volunteers who had died at Lacolle and Odelltown while opposing a large band of rebels who had gathered on the American side of the line a few days previously. He opened the subscription list with "the handsome sum of Ten Pounds" and in a few minutes £60 was raised and sent to Lieutenant-Colonel Taylor, Commander at the frontier, for his further action. Two years later, fifty members acting as individuals, but not the Society itself. were part of fundraising for the purchase of what to admirers of Scotland's National Bard was, and is, a valued historical item- the Bible which Robert Burns gave to his cherished "Highland Mary" at their final parting on May 14th, 1786. It consists of two volumes, bound in calf with gilt edges. Traces of their names and Burns' Masonic mark are on the flyleaf of Volume One, and a lock of Mary Campbell's hair is attached to one of the other pages. The Bible remained with the Campbell family in Scotland after Mary's untimely death in October 1786, until her nephew, William Anderson, set sail from Greenock to New York in 1834, with the two volumes in his possession. He was bound for Upper Canada and settled in the township of Caledon. Six years later, living in Toronto and in poor circumstances, he offered the Bible for sale in Montreal in the hope that, apart from personal profit, the two small volumes would be secured in a place of safekeeping. The two volumes were purchased for £25 from funds raised by a Subscription Committee, chaired by a Society member, Robert Weir, Jr., Editor and Proprietor of the Montreal Herald. At a meeting of the seventy subscribers, it was resolved that the Bible should be sent to Scotland and deposited in the Burns Monument in Alloway. Mr. Weir, as Chairman, arranged for its transportation, with the accompanying documents and list of subscribers, to his father, Robert Weir, Sr. who was resident in Glasgow. He handed the total consignment to the Provost of Ayr. The Bible was deposited in the Monument but some time later the accompanying documents were offered for sale by a bookseller in Edinburgh. "Through the energetic of forts of Provost Goodie of Ayr and Mr. W H. Dunlop of Doonside, Secretary to the Burns' Monument Trustees, they were purchased by the Trustees and placed in the Monument beside the Bible". The list of subscribershandwritten by one of the Society's members. James M. Millar, begins with the following names: Hon. Peter McGill, President and Mayor of Montreal. Rev. Henry Esson, Chaplain, Dr. McCulloch. J.C. Becket. Chairman-Charity, John Boston. Vice President - all of them officers of the St. Andrew's Society of Montreal. Altogether fifty of the seventy subscribers were identified as members of the Society. This was apparently another instance in which the Society could not take an official part in, or contribute from its funds, which were earmarked for charity, but one which the members carried through as private individuals. It was a very commendable and praiseworthy action and has been greatly appreciated by the Scottish people and Burns' Societies all over the world. To commemorate the Society's Sesquicentenary in 1985, the two small volumes again crossed the Atlantic to be displayed for one year at the exhibition at the McCord Museum entitled "A Celebration: St. Andrew's Society of Montreal, 1835-1985". They had been graciously loaned by the Burns Monument Trustees and were personally returned by the Society's Historian, Mary Johnston Cox, to their Curator at the Museum in Alloway on October 20th, 1986, the 200th anniversary of Highland Mary's death. "But still within my bosom's core, Shall live my Highland Mary"
"were it not for the St. Andrew's Society of Montreal, every soul of them would have starved to death that winter in a strange land - their only support being contributions from the charitable inhabitants of the town of Sherbrooke and its neighbourhood." Lake St. Louis was the scene of a tragic accident on July 8th, 1842 when a small high-pressure steamer, the "Shamrock", burst her boiler shortly after leaving Lachine. The force of the explosion blew the bow completely out of the boat which sank almost immediately, drowning sixty passengers. Among the survivors were a number of Scottish immigrants. As they had lost all their possessions, an appeal was made to the St. Andrew's Society but the same constraint that prevented the use of the Society's funds to assist the Lewis immigrants also applied in this particular case. Once again, members and others were asked to contribute and the money raised was sent to the Rev. John Taylor of Lachine for distribution to the Scottish survivors. At the November annual meeting, instructions were given to the President, Treasurer and Secretary to invest in Montreal Bank stock "as much of the permanent funds as could conveniently be spared." The following November the President announced that in compliance with the order given in November 1842, he had purchased twelve shares of the stock at the price of £51.10s per share or three percent premium, to be held in the names of the President, Treasurer and Secretary. This first recorded investment transaction substantiated the widely held view that the Scots and banking, sooner or later, gravitated towards one another. As it was in 1836, at the opening of Canada's first railway, the St. Lawrence & Champlain Railroad, so also was it an eventful occasion at the commencement of the St. Lawrence & Atlantic Railway on August 8th, 1846. There was great excitement and celebration in the city of Montreal. The St. Andrew's Society loaned its banners for the occasion and participated in the ceremonies at Champ-de-Mars. This was an era of firsts particularly in the field of telecommunications, steamships and railroad transportation. These new developments brought prosperity to many in Montreal and the resulting enthusiasm is understandable. For example, ten years later the report of the Society's meeting of November 13th, 1856 (relating to the St. Andrew's Day plans) reads: "The Preparatory Meeting was held this evening but no business was done, it being resolved that in consequence of the excitement caused by the railroad celebration, the meeting adjourn till the 17th instant." This celebration evidently referred to the opening of Grand Trunk's first line between Montreal and Toronto, a fifteen-hour journey according to records. On January 29th of the following year, the St. Andrew's Society joined the other national societies in a combined procession to honour the entry of the Governor General, The Rt. Hon. James Bruce, The Earl of Elgin, into the city. The month following, at a meeting of the Society on February 11th, it was unanimously agreed that both the Earl of Elgin and Colonel The Hon. Robert Bruce be admitted as Honorary Members and to request Lord Elgin to allow enrolment of his name as patron to the St. Andrew's Society, to which His Excellency later signified his acceptance. From the Society's inception and until 1876, with few exceptions, members honoured the anniversary of Scotland's patron saint on November 30th by walking in procession from the location of their annual meeting to the church, which had been chosen for that year's special sermon. The Society's banners were always carried with pride, and on many occasions regimental pipers accompanied the participants. In the evening, the men customarily attended a dinner at one of the local hotels. However, for the 1848 celebrations, proposals were approved for a Caledonian Assembly (Ball) at Donegana's Hotel. Among the guests were the Governor General, The Earl of Elgin, Lady Alice Lambton, Colonel Bruce and Mrs. Bruce; and also Lord Mark Kerr. From all accounts, it was "a splendid affair" much enjoyed by all those present as well as His Excellency and his entourage, who stayed until "the wee short hours ayont the twal." The celebration of 1848 was in sharp contrast to a distressing event that occurred in the spring of the following year. Recognizing the property losses and damages sustained in Lower Canada during the rebellions of 1837 and 1838, Parliament, in 1849, passed the Act of Indemnification (known as the Rebellion Losses Bill). This controversial Bill would indemnify all those who had incurred losses, be they Loyalists or Rebels, and was similar to legislation drafted for losses in Upper Canada, and passed a few years before. The act was immediately denounced by Tories as: "a revolutionary measure, unprecedented in the history of civilized nations, by which the victorious defenders of the Throne are to be taxed to pay the losses of the defeated rebels". On the afternoon of April 25th 1849, prior to the arrival of the Governor General at the Parliament Building in St. Ann's Market, the Loyalist opponents of the Bill crowded into the Chamber's galleries where they quietly remained throughout the proceedings until the moment when Lord Elgin as the Crown's representative, gave his assent to the contentious Bill. The signing of the Act, the era or Responsible Government had begun in the colony. Thereupon, the previously silent spectators made a deliberately noisy exodus and joined the angry crowd outside. On his emergence from the building, the Governor General was greeted with jeering and catcalls, and then pelted with eggs and refuse. His open landau provided little if any protection, but thanks to the speed of his horses he was able to reach his residence at Monklands in safety. After a massed meeting that evening at Champ-de-Mars an unruly crowd, some carrying lighted torches, marched to the Parliament Building bent on destruction. Following the rioting and later explosion, fire finally consumed the whole structure. Not only did Montreal lose its Parliament Building because of these actions but also its opportunity to be the country's seat of government. As many of the Society's members had served as "victorious defenders of the Throne" it was not surprising that three days later President (Sir) Hugh Allan called a special meeting. It was resolved and unanimously carried by the seventy-one members present: "that the Earl of Elgin having so conducted himself in his Government as to insult and outrage the feelings of every British subject in Canada, and to disgrace the Scottish name, this Society, with the deepest regret, considers him unworthy to continue longer as its Patron and that he be, therefore, from henceforth, removed from that office" and "that the name of the Earl of Elgin be erased from the list of Honorary members of the Saint Andrew's Society ." By the month of November, 1849, however, ill feelings still prevailed within the Society on the matter, as witnessed by the lengthy discussions at three meetings regarding whether or not the toast to the Governor General should be included on the proposed toast list for the St. Andrew's Dinner. Not until the third meeting on the 27th was the proposal finally carried that the toast should be included on the list, and given from the Chair. Nevertheless, on the evening of November 3rd the Society was divided into two companies, the first the more affluent, the second the mechanics (skilled labourers).. One group dined at Compain's Hotel and the other, chaired by President Allan, at Mack's Hotel where he proposed the toast "To the Governor General" adding that "it was the duty of all good subjects to respect the office, whatever might he their opinion respecting the individual who held it." The majority of those present, however, chose to ignore the salutation. The furore had evidently subsided by the fall of 1851, when Lord Elgin visited the city. It was recorded that after an exchange of speeches many came forward to shake his hand and at his departure, thousands gathered on the quay to wish him a safe journey. "Such is the record of the only excursion of the Society into the political arena. " It was also the only time the Society's members officially chastised the actions of a Scottish Peer of the Realm, and especially one who was a descendant of Robert the Bruce. More than one hundred years later, it was a case of "let bygones be bygones" when the St. Andrew's Society invited Lord Elgin's descendant, the Rt. Hon., The Earl of Elgin and Kincardine to be Guest of Honour at the St. Andrew's Ball of 1972 and also to become an Honorary Member of the Society, which he graciously accepted. He would later present the Society's President with an inscribed silver quaich and a scroll that read, in part: "This address is offered on St. Andrew's Day, 1972 by the Earl and Countess of Elgin to restore a friendship between the St. Andrew's Society of Montreal and the Family of Bruce which had lapsed briefly over the past one hundred and twenty-three years. " On November 17th, 1852, at the invitation of the Mayor of Montreal, the St. Andrew's Society joined in the city's mark of respect to the memory of the late Duke of Wellington. The Society's officers and members, with their badges and banners, proceeded to the Cathedral in company with "their brethren of St. George's Society. " For a number of years some members had suggested that a format other than the annual all-male dinners should be established, but with the exception of the Caledonian Assembly in 1848 the dinners continued until 1855 when the Society cooperated with the newly formed Caledonian Society in celebrating the St. Andrew's Anniversary with a soirée. This was pursuant to an amendment of the Society's Constitution, in 1854, with regard to the manner in which the Anniversary should be commemorated. The amendment was that the Society "shall celebrate the day by dining together, or in any other way which the majority of those present at the Preparatory Meeting shall deem advisable." The Caledonian Society was originally formed as a complement to the St. Andrew's Society, its principal purpose being the encouragement of Scottish athletic games and sports, history, poetry and song, an annual Halloween concert, and other social activities. The two Societies worked in harmony with one another "sharing the same spirit of patriotism and charity, " and all of the Caledonian Society's surplus proceeds were added to the St. Andrew's Society's charitable funds. Many of its members had joint memberships in both Societies and in later years at least two of the Caledonian Society's Presidents had also held the same office in the St. Andrew's Society. 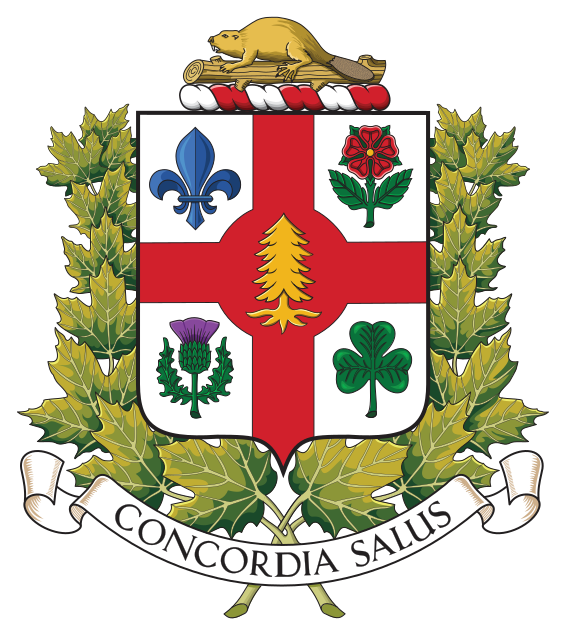 Since its inception, the Society's position in Montreal had been well established and recognised due to its charitable endeavours, particularly its dedicated ministering to the desperate needs of the Scottish immigrants, many arriving from the Highlands and Western Isles. Aid, however, was not only provided to the needy in Montreal, but also to others outside the area by means of subscriptions raised by assigned members. For example, in 1852, a resolution was passed authorising the formation of a committee to take up a subscription in aid of a second group of destitute Lewis immigrants who had settled in Lingwick. On many other occasions, subscription committees were appointed to obtain collections for justifiable purposes far beyond the confines of Montreal and surrounding areas. One such situation arose in 1847 when it was described "that the meeting deeply deplores the misery and destitution to which a large portion of the inhabitants of the Highlands of Scotland are reduced by the failure of their crops during the past year and considers it a duty incumbent upon them to do all in their power to aid in mitigating the distress which it has pleased Providence to inflict upon their country-men." Also, during the Crimean War, the sum of £372 was raised in contributions and sent to the Patriotic Fund in the United Kingdom for the benefit of the widows and children of "those brave men who have perished in the service of their country." When in 1856 a request was received from Scotland to raise funds towards the erection of a monument to William Wallace at Stirling, the Society enthusiastically complied and a committee was appointed to join with the Caledonian Society in obtaining subscriptions from the Scottish community. The outcome was the remittance of a "handsome donation" to the National Fund in Scotland. In the spring of 1857, a special committee reported on an experimental trial that had been conducted by the Society with regard to the use and maintenance of a Home as a temporary shelter for transient immigrants and homeless Scots. Subsequently, a house on Hermine Street was leased for a six-month period and the President guaranteed the rental charges. Gratified by the project's success, the Society decided to lease a larger three-storey house on St. George Street for a period of seven years. The Charitable and Educational Endeavours section of this handbook includes more information on the various homes operated by the Society over the years. In 1858, the Society was incorporated as a non-profit corporation by Act 22 Victoria Cap. 138 of the Statutes of the Province of Canada, to facilitate the execution of its objectives and affairs. On September 1st of that same year, at the invitation of the Mayor of Montreal, the national societies marched in the city's procession to commemorate the successful laying of the Atlantic telegraph cable. The members of the St. Andrew's Society "mustered strongly at the Mechanics Institute and proceeded to the Champ-de-Mars, accompanied by the Caledonian and Thistle Societies, headed by a piper and MacPherson's Independent Band, and there joined in the procession which marched through the principal streets. " January 25th, 1859 being the Centennial of Robert Burns' birth, the Caledonian Society had requested the St. Andrew's Society's co-operation in holding a concert and ball to celebrate the occasion. After discussion, however, it was decided that the Burns Centenary celebration should be held under the auspices of the recently formed "Burns Club” which included a number of Society members. A banquet was subsequently held in the City Concert Hall at Bonsecours Market, chaired by the Hon. John Rose, Past President of the St. Andrew's Society, the assemblage being described "as brilliant as any, perhaps, that ever met within its walls." For many years after the 1859 commemoration, the Scottish community of Montreal had wanted to erect a monument in memory of Scotland's national bard. However, it would not be until the next century that the dream would be transformed into reality when the Society became unofficially involved after being canvassed by William McBroom of the Ayrshire Association in 1929. Following the standard practice, a special committee was elected to raise the necessary funds and choose the monument, a replica of the one at Ayr in Scotland. The appeal was successful. Members of the Society comprised 85 percent of the subscribers, and their contributions amounted to 95 percent of the total amount raised. To the gratification of the committee, the project was under budget by $25, the final cost being $12,467. It is noteworthy that funding was obtained despite the stock market crash of 1929 and the ensuing depression. The unveiling of the monument at the northwest corner of Dominion Square (later Dorchester Square) took place on October 18th, 1930 before the largest gathering of Scots ever assembled in the city of Montreal. Shall brithers be fo ra ' that. " As a further note of interest, on July 21st 1996 a wreath-laying ceremony, organized by the Society, was held at the monument to commemorate the 200th anniversary of the poet's death. On July 11th, 1859, a Subscription Committee was appointed to raise funds in the amount of £75 in aid of the starving and destitute inhabitants of the townships of Bruce and Kinloss in the county of Bruce, Canada West where their crops had failed. The financial details, however, were decidedly different from any previous procedure in that the committee was authorized to loan the said amount to the two townships on the security of debentures payable in two years. The letter enclosing a Bank of Montreal draft expressed regret that the amount could not be larger. The draft was "handsomely acknowledged" and by November of the following year the loan was re-paid by bond, which matured the following May. The promptness of settlement was immediately and gratefully acknowledged. At 8 a.m. on August 25th, 1860, the Society's members met at the Mechanics' Hall. Led by three pipers, they marched to the Champ-de-Mars to join the procession in honour of H.R.H. The Prince of Wales on his arrival in Montreal where, during his visit, he laid the commemorative stone and drove home the last rivet of silver on the recently completed Victoria Bridge. The city was not only adorned for the weeklong event but was also aglow, indoors and out, by "the modern type of illumination" - gaslight. One of the outstanding events in the year 1862 was a musical festival, at which Sir William Dawson and the Hon. Thomas D'Arcy McGee were the principal speakers. The "generous" proceeds, due to the eloquence of those two celebrated gentlemen, were donated to the St. Andrew's Society's Charitable Fund. McGee was a frequent speaker at the Society's events, and its benevolent endeavours always met with "a very warm hearted and generous response from him.” In his speech, he praised the remarkable efforts of the Ladies Committees and the St. Andrew's Home: "They hold the National maxim that no man need for "honest poverty hang down his head and a' that". They listen to the stories of' those whose lives have been woven closely with struggling and with suffering; they stretch down and they lift up; they give cheerfully yet measure wisely what they give to the fatherless, the 'friendless and the stranger within our gates. " This astute observation and praise of their benevolent deeds was much appreciated by the Charitable Committee. When McGee was assassinated in April 1868, the Society "feeling their deep obligation for his many acts of kindness" adopted the following motion: "That in order to show the appreciation of this Society of Mr. McGee's worth, as a public man and a statesman, and their gratitude fir the sympathy and assistance he extended to it on so many occasions, it is resolved that this society do attend his funeral in a body, wearing suitable mourning badges." During their term of service in Montreal, the officers and men of the 78th Highland Regiment (Ross-shire Buffs) had on many occasions provided assistance to the Society, the Pipers of the Regiment having often performed in the St. Andrew's Home. They had also marched and played most impressively in the Society's annual St. Andrew's Day processions, and with their Commanding Officer, Lieutenant-Colonel Colin MacKenzie attended the Society's annual dinner on November 30th, 1868. This famous regiment, later known as the Seaforth Highlanders, was held in high esteem by the St. Andrew's Society and the entire Scottish community. Eleven years earlier, in India, as the 78th fought its way through to relieve the Residency at Lucknow in 1857; it was the sound of the pipes playing "The Campbells Are Coming" that gave encouragement to the beleaguered defenders. Those same pipes of Lucknow fame were proudly played and proudly heard each time the regiment marched through the streets of Montreal. When the regiment departed in May 1869, the Society presented Lieutenant-Colonel MacKenzie with a letter of appreciation that read in part: "The St. Andrew's Society of Montreal cannot permit the gallant 78th to leave the City without expressing the deep feeling of regret which their approaching departure has awakened in the minds of their fellow countrymen in the City of Montreal. The Society cheerfully avails itself of this occasion to bear testimony to the exemplary behaviour of the 78th since its arrival here and trusts that the high character which the Regiment has always borne, will prove a passport to the affections of their Countrymen in whatever quarter of the world Providence may cast their lot. " In 1873, the Society's representatives met with those from the other national societies to discuss the protection of immigrants on their arrival in the city and to jointly take the necessary measures to remedy the situation. It was also resolved to accept the invitation to attend the funeral of Sir George Etienne Cartier, in company with the other Societies. At the Preparatory Meeting in November 1876, it was proposed that the annual procession be discontinued. This motion was carried by a majority but another motion to increase the members' annual subscription from $2 to $4 was defeated. In 1881, the Society's outstanding debt was cancelled thanks to the President's successful efforts in obtaining the amount of $3,400 by subscriptions. "A motion thanking him for his energetic action was carried amidst applause." On May 5" of the same year, a small booklet of the revised By-Laws of the Society, together with the Act of Incorporation (1858) and a list of members was published. This would seem to be the first such publication since the issuance of the Narrative of the Proceedings of the St. Andrew's Society of Montreal by (Sir) Hugh Allan in 1855 which was also published in booklet form. With regard to the Society's burial lots in Mount Royal Cemetery, the first one was donated in 1857 by the Mount Royal Cemetery Company. The location was carefully selected by the Society with a view to the future purchase of the adjoining lot. After this purchase, two more lots were donated, one by the Mount Royal Cemetery Company and the other by President Alex McGibbon. It should be mentioned that, prior to 1857, the Society had acquired gravesites in other cemeteries but as the years progressed additional lots were purchased in the Mount Royal Cemetery. In all, more than 300 Scots, or those of Scottish descent, have been buried in these gravesites at the Society's expense, each one honoured by a befitting funeral service. In the years 1883 and 1884 a total of $600 was voted towards the erection of a monument to commemorate the Scottish immigrants who had perished in the burning of the S.S. "Montreal" in 1857. At their burial site, a later monument to their memory was unveiled in 1982 by the Guest of Honour for that year's Ball, The Rt. Hon. The Earl of Mansfield. Previously, in 1953, an appropriate granite memorial was also unveiled at the location of the other gravesite. The exchange of St. Andrew's Day greetings, by telegraph, between the Society and other Scottish associations began in 1864. The first such message, to which the St. Andrew's Society of Montreal replied in kind, was sent from the Hamilton Society. By November 30th, 1875, greetings were being exchanged "with sister societies throughout the world." Although the telegraph is no longer used, this tradition still continues. Owing to floods and the alarming smallpox epidemic in the city, it was decided to cancel the Society's Jubilee celebrations in 1885. The following year, however, there was a special church service at St. Paul's where the Rev. James Barclay preached the sermon - "ye shall hallow the fiftieth year". In closing his address, he remarked that "we give thanks today alike for the land to which ire have come and the land where we were born". In 1898, the Society's motto "Relieve the Distressed" was changed to Scotland's motto which was already shown on the Society's Seal, "Nemo me impure lacessit" ("Touch me not with impunity") or, as one would say in the Scottish vernacular, "Touch me gin ye daur" or ""a' daur meddle wi' me." Although the Society's debt of $3,400 had been repaid in 1881, it rose steadily in the following years due to the charitable endeavours. However, in 1899, as had been the case eighteen years earlier, another President was successful in raising sufficient funds ($3,480) not only to clear the outstanding debt but also to contribute repairs and new furnishing for the Home, leaving a balance of $140 in the hands of the Treasurer. After several decades of charitable work involving an expenditure of approximately $140,000, the Society made its first appeal the public in November 1904 to raise funds and clear the debt outstanding on the St. Andrew's Home. A "Fancy Fair", organised by the ladies of the St. Andrew's Soclety and the Caledonian Society was field at the Windsor Hotel over a four-day period, ending on November 30th. The event, named the "Seven Ages of Women"was a great success with crowds of people waiting in line for hours outside the hotel. An abundance of volunteers was available staff the tables and, as always, there were navy generous donors, in particular Lady Strathcona and Sir William MacDonald. The event raised almost $9,362, which cleeared the debt in full and provided funds or the charitable endeavours. "Without doubt there is reason to congratulate the Society in its choice of Presidents and to feel gratitude that they have so loyally answered the call. " These words appear in the Society's earlier records and they still hold good today. One has only to study the list of Past Presidents to appreciate how fortunate the Society has been to have had so many prominent and outstanding people at the helm protecting its interests throughout the years. A special notice in the "Gazette" newspaper, published in 1889, noted the remarkable influence of the Scots in Canadian public life. It mentioned ten of the Society's Past Presidents: The Hon. Peter McGill; The Hon. James Ferrier; Sir Hugh Allan; Sir John Rose; The Hon. Alexander Morris; Hon. John Young; Sir Alexander Galt; R. B. Angus; Sir Donald A. Smith (Lord Strathcona); Duncan McIntyre; plus many members including Sir George Stephen (Lord Mount Stephen) and (Sir) Hugh Graham (Lord Atholstan). Thanks to their experience and dedicated service throughout these founding years, as well as the devotion of many others, the St. Andrew's Society at the beginning of the 20th century was in an excellent position. Its finances were sound, and it had worked diligently in pursuit of its aim to "Relieve the Distressed". The words sent by the Society's President to Queen Victoria on the occasion of her Jubilee Year in 1887 were, therefore, appropriate: "The object of this Society has been, and is, to extend a brotherly hand to all Scotchmen coming to the Dominion; to keep them from poverty, to rescue them from temptation and crime; to save them, from idleness - the parent of both, and the generosity of Scotchmen has enabled the Society most filly to accomplish this object. The aim of the Society has been to treat every Scotch immigrant as a brother, to maintain his self-respect, to find him honourable employment, to surround him at once on his arrival in the new land with all the helpful influences to which he was accustomed in the old. So successfully has this aim been realised that a Scotchmen applying for aid to a charitable institution is a rare exception in Canada; and that the Society numbers now on the roll of its generous benefactors some who were once the grateful recipients of its bounty." By the closing of the 19th century, the original members who had built the Society on a solid foundation had passed away. Their intense deep-rooted love for Scotland had gone with them but they had left behind their traditions and their benevolent concern for less fortunate fellow Scots as a legacy for future generations. Those who followed, while distinctly Canadian remained proud of their Scottish heritage and traditions. They too, committed themselves to the Society's charitable endeavours with the same enthusiasm and energy as their Scottish predecessors. This continuing dedication to the Society's interests and concerns ensures that the St. Andrew's Society of Montreal is still in that same "excellent position" at the beginning of the 21th century as it was at the beginning of the 20th century. Its well-being is still in good hands - be they Scottish or Canadian.